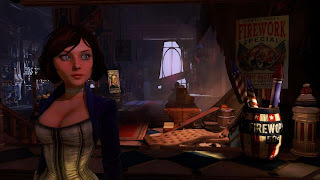 Irrational Games and 2K have announced that Bioshock Infinite will be available this October for Xbox 360, PlayStation 3, and PC. Infinite is the second Bioshock title helmed by designer Ken Levine, and will take place in a city in the skies. Bioshock is one of my favorite games series, and I can't wait when October rolls around. This is sure to be a Game of The Year Contender! "BioShock® Infinite is a first-person shooter set in 1912. It lifts players out of the confines of Rapture and rockets them to Columbia, an immense city in the sky. Originally conceived as a floating symbol of American ideals, things turn drastically wrong as the city disappears into the clouds. The player assumes the role of former Pinkerton agent Booker DeWitt, sent to the lost city to rescue Elizabeth. There he will augment his abilities with hers and will learn to fight foes in high-speed Sky-Line battles, engage in combat and harness the power of dozens of new weapons and abilities."